Vital pulp therapy of the inflamed pulp, on the other hand, affords an inferior success rate. Therefore the optimal time for treatment is in the first 24 hours, when pulp inflammation is superficial. As time increases between the time of injury and therapy, pulp removal must be extended apically in order to ensure that noninflamed pulp has been reached. Bacteria-tight seal: In the authors’ opinion, a tight seal is the most critical factor for successful treatment. Challenge by bacteria during the healing phase will cause failure. On the other hand, if the exposed pulp is effectively sealed from bacterial leakage, successful healing of the pulp with a hard-tissue barrier will occur independent of the dressing placed on the pulp. Pulp dressing: Presently, calcium hydroxide is the most common dressing used for vital pulp therapy. Its advantages are that it is antibacterial33, and will disinfect the superficial pulp. 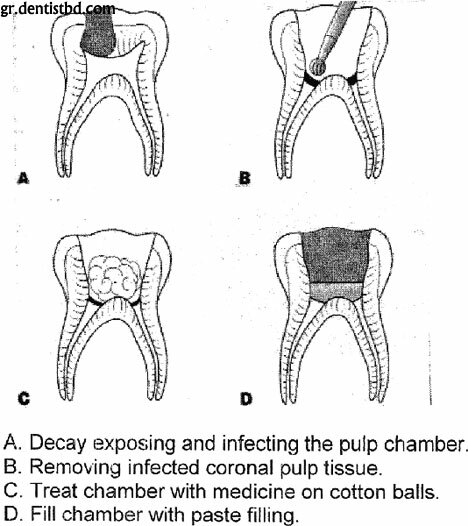 Pure calcium hydroxide will cause necrosis of about 1.5 mm of pulp tissue, which removes superficial layers of inflamed pulp if present .The high pH of 12.5 of the calcium hydroxide causes a liquefaction necrosis in the most superficial layers of the pulp.99 The toxicity of the calcium hydroxide appears to be neutralized as the deeper layers of pulp are affected, causing a coagulative necrosis at the junction of the necrotic and vital tissue, resulting in only a mild irritation to the pulp. This mild irritation will initiate an inflammatory response and, in the absence of bacteria, will heal with a hard-tissue barrier . Hard-setting calcium hydroxide will not cause necrosis to the superficial layers of pulp but has been shown to initiate healing with a hard-tissue barrier also.